The 2011 OBF is in the books and a fine festival it was. A few comments are definitely in order. Attendance: As mentioned earlier, I'll be interested to see the final attendance numbers. I was there for three of the four days and the crowds were larger than any I can remember in 20+ years. The weather was perfect, obviously, and the festival seems to be attracting and increasing broad audience. I also think lousy economy played a part. The OBF isn't super cheap entertainment, but it is far cheaper than a trip to Sunriver or the coast. Anyway, it may be time for Art Larrance to again consider expanding the festival. And I'm not talking about the sour beer showcase planned for OBF Tuesday next year. I'm talking about possibly Wednesday. I can honestly see the OBF being a week long someday. Hammerheads: A few people probably know McMenamin's was the host brewery this year. 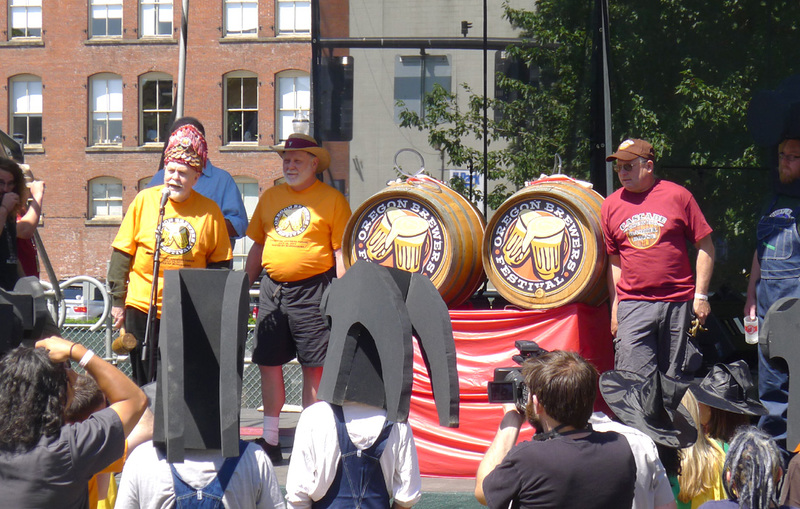 That meant, among other things, that the ceremonial kegs (barrels) were McMenamin's beer. I never heard an official announcement, but I assume the beer was Hammerhead. I assume this because 1) I know Hammerhead is one of their more popular beers, and 2) there were McMenamin's shills with foam hammerheads in the parade and in the gallery during the ceremonial tapping. Okay, the foam hammerheads were arguably a cute marketing touch. But they were obnoxiously blocking almost everyone's view of the stage. Not the best planning folks. Honest Tastes: We all know the volunteers who work the festival are largely responsible for its success over the years. I've poured beer and worked as a supervisor many times. I know the drill. So I was not surprised when several servers failed to fill my mug to the taste line. This happened early on. I know the people pouring the beer are told to limit the size of pours. That's cool. But I'm paying $1 for 4 ounces of beer and I expect to get 4 ounces of beer. After those initial issues, I checked pours every time and servers were always happy to fill my mug to the line if they had shorted me. Short staffed: I know it's difficult to plan volunteer staffing for the OBF. You don't want people standing around with nothing to do and you don't want too few people. It seems to me they may have erred on the side of not enough staffing this year. I say this because there was really no excuse for some of the lines I saw on Friday and Saturday afternoons. We're talking very long lines. Several times I walked up to the front and found one person pouring and one filling pitchers for multiple beers. If you like long lines, that's a great strategy. It looked like they just didn't have enough people to keep up. Another thing I saw, even when it wasn't all that busy, was sloppy organization. In one case, there was a huge line for Firestone Walker and only two people manning that tap. On the same trailer, there were people standing around with no lines. Not great. Led Zeppelin: The quality of the music acts at the OBF is typically not great. I suspect that's because the people that play are doing it mainly for fun or exposure...they aren't getting paid or they're getting paid very little. But Stairway Denied, the Led Zeppelin tribute band that played Saturday afternoon, was terrific. They worked their way through a hoard of Zep classics and attracted a good crowd. The lead singer did a pretty good Robert Plant and the rest of the band was solid. I talked to the singer after the show, asking him where they usually play and when. He said they seldom play in public...only every six months or so. That seems like a waste of talent to me, but maybe the OBF just happens to be a perfect venue for a band like this. Hope everyone had a great festival. The countdown is on for next year! I agree. As the lines got near the tables people passing through the tent had to find "paths" through the lines. Even though I was only there a few hours I did my quota of grumbling to my self about how long it took to get a beer. Better serving efficiency, whether via more people or better organization, would alleviate the issue with lines into the tents. This isn't a new problem. Sometimes I think OBF organizers like the long lines because they encourage people to spend 4 tokens on full beers. That's a better financial deal for the festival.